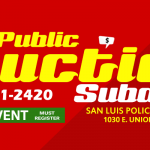 The San Luis Police Department arrested several suspects over the weekend in connection to multiple burglaries. On Friday evening around 8:00 PM, SLPD Officers first responded to a report of a residential burglary that had been reported at the 200 Block of Independence Street. The suspects took multiple house hold items and stole a vehicle from the residence. A few hours later, the vehicle was located by the Yuma County Sheriff’s Office at the 300 block of May Avenue in Yuma. SLPD arrested 23 year old Ivan Vieyra and 33 year old Jesus Arbizo in connection with this residential burglary and theft of vehicle. Both Ivan and Jesus were booked into the Yuma County Jail on several felony charges. Early Saturday morning, SLPD responded to a report of a residential burglary that involved three juveniles whose ages ranged from 15 to 17 years of age. The first burglary was reported to have happened at the 1900 Block of Udall Lane. Officers responded to the 300 Block of Los Tres Hombres and then to the 1500 Block of Liberty Street regarding more burglaries. Evidence gathered at these locations were able to link the juvenile to these crimes. SLPD Officers were able to identify the juvenile suspects based on video surveillance footage installed at one residence that had been burglarized. SLPD Officers were able to locate two out of the three suspects and arrested them. The two juveniles arrested were booked into the Yuma County Juvenile Detention Center while the third juvenile is pending arrest. SLPD recommends to all home and business owners to take measures to ensure that you are not a victim of burglary or theft. Business owners and home owners are encouraged to install a security system to provide added protection from thieves.